It gives me great pleasure to welcome you to this 24th Annual General Meeting of Shareholders of AFREXIMBANK. On behalf of the Government and people of Rwanda and on my own behalf, I welcome you all to Rwanda and invite you to feel at home and experience our warm hospitality. Let me first of all thank Afreximbank leadership for having chosen Rwanda as the host of the 24th AGM and I believe this clearly demonstrates our strong partnership and the role the bank is playing in supporting the Country’s economic transformation. The Bank has provided direct financing in an amount of US$155 million in support of various development projects including this Convention Centre and Hotel and other projects in pipeline are being considered for funding by the Bank. 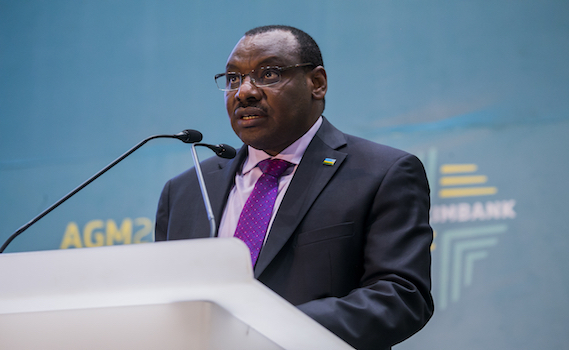 The Government of Rwanda (GoR) adopted Vision 2020 with the ultimate goal of transforming the country into a middle- income nation by 2020. This Vision aims at promoting structural transformation and ensuring regional and international economic integration; among other pillars. At the same time, Africa has experienced adverse effects of recent global shocks characterized by volatile commodity prices and contraction of global demand in the face of growing protectionism, and financial market volatility which has resulted in massive capital outflows from developing to advanced economies. In light of the above, Africa needs strong and sound financial institutions like AFREXIMBANK in order to achieve its development agenda. Although Africa’s trade has witnessed remarkable growth, especially over the last two decades, rising from US$210 billion in 1996 to US$1.2 trillion in 2015, its share of global trade has barely changed. At the same time, despite the relative improvement observed over the last decade, intra-African trade has remained very low, at about 15% against 67% in Europe, 53% in Developing Asia and about 37% in America. This low performance is due to key challenges that have hampered economic development and structural transformation of African economies like; Infrastructure deficit, insufficient export diversification; the small size of economies and market fragmentation on the basis of low level of integration; the low level of intra-regional trade among African countries and over-reliance on export of natural resources and primary commodities which have undermined the capacity of countries to effectively enter global value chains. In this context, you will agree with me that the relevance of AFREXIMBANK on our continent is unquestionable. The bank was established to promote intra-African trade and value addition. This is aimed at increasing competitiveness of Africa’s exports as well as enhancing the capacity of African economies to effectively deal with the exposure to recurrent adverse global shocks and contribute to ongoing efforts to accelerate the process of economic growth and structural transformation. This mandate remains very critical especially today. We therefore must embrace the opportunity provided by the 24th AGM of creating a platform that will bring together the shareholders and global experts in these areas for a dialogue and deliberations; whose outcomes will contribute to shape our strategic focus on our shared vision of Africa and its development aspirations in an increasingly competitive global economic environment. The main theme for the 24th AGM “Trade Finance and Export Development in Africa” is expected to form the basis of the deliberations. I have no doubt that the theme we have is comprehensive enough to examine the broader spectrum of Africa’s development challenges and possible solutions. In addition to heavy investment in infrastructure, African trade is transformed will be transformed through connecting fragmented and disconnected markets by deepening intra-African trade and economic integration. However, this will necessitate building regional value chains which have the potential to generate enormous benefits for African economies. I believe that that the creation of Regional Value Chains in Africa along several product lines could ease the integration of African economies into Global Value Chains. In this context, ongoing efforts to deepen regional economic blocks within Africa offers tremendous opportunities to draw on economies of scale to transcend the natural and environmental constraints imposed by its geography. The benefits of Integration are not questionable. A case in point is the East Africa Northern corridor example. Several events like advisory group meetings, seminars, Investment Forum and Trade Exhibition are organized on the sidelines of the 24th Annual General Meeting to provide an important platform for stakeholders from African private and public sector to explore investment opportunities and policies to accelerate ongoing efforts to promote industrialization and intra-African trade. Eventually the growth of African industries supported by industrialization and intra-African trade will go a long way to expand the tax base, improve economic management and living standards of the population throughout the continent. Allow me to end my remarks by once again thanking all participants and leadership of AFREXIMBANK for having chosen Rwanda to host the 24th AGM of shareholders. I also wish to pledge the Government of Rwanda’s continued collaboration with AFREXIMBANK, because Rwanda believes in AFREMXIMBANK’s mission. I wish the AGM very fruitful deliberations as you chart the way forward for AFREXIM’s operations in the next year across the African continent.